Hank Marsilio was a most generous man. 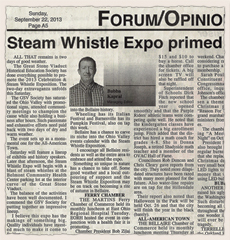 Hank along with many of his era of steam enthusiast friends donated much of their time, their equipment, their expertise and love of history to contribute to the 2013 GSV Steam Whistle Expo. Hank will be sadly missed. The Ohio History Connection, formerly the Ohio Historical Society, is a statewide history organization with the mission to spark discovery of Ohio’s stories. 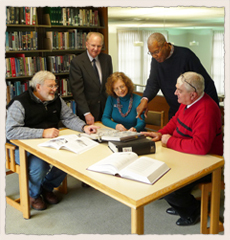 As a 501(c)(3) nonprofit organization chartered in 1885, the Ohio History Connection carries out history services for Ohio and its citizens focused on preserving and sharing the state’s history. This includes housing the state historic preservation office, the official state archives, and the local history office. The Ohio History Connection also manages more than 50 sites and museums across Ohio. 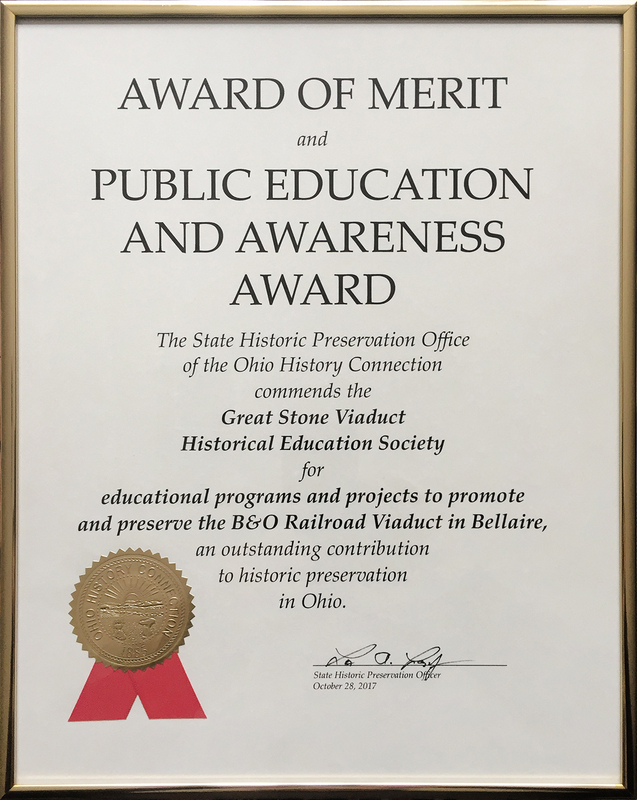 Each year, the Ohio History Connection’s State Historic Preservation Office recognizes achievements in historic preservation by presenting awards in two categories: Public Education and Awareness, and Preservation Merit. The Public Education and Awareness Award is for increasing interest in historic preservation. Eligible activities include, but are not limited to, media, newsletters, publications, interpretation, original research, educational programs and special events which have substantially increased public understanding and awareness of historic preservation at the local, regional or state level. 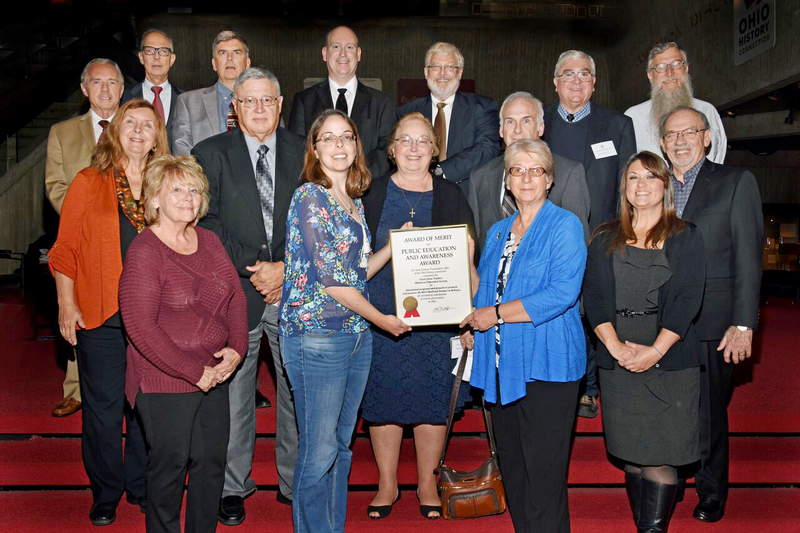 The Preservation Merit Award is for preserving Ohio's prehistory, history, architecture or culture. 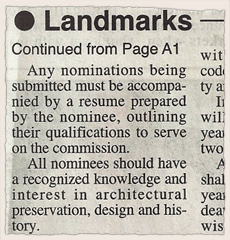 Eligible activities include, but are not limited to, restoring, rehabilitating or otherwise preserving an important building or site, longtime stewardship of a property, promoting protective legislation, funding preservation projects, offering leadership, support or service, and furthering preservation at the local, regional or state level. COLUMBUS - Historic and unique bridges have a way of sticking in our collective memories. Many of us remember the bridge we crossed walking to school, a landmark on the way to visit relatives, the gateway out of town or a welcoming indication that you are back in familiar territory. The Ohio Department of Transportation, in collaboration with the Ohio Historic Bridge Association, Ohio History Connection’s State Historic Preservation Office, TourismOhio and historicbridges.org, has assembled a list of stunning bridges across the state that are well worth a journey. 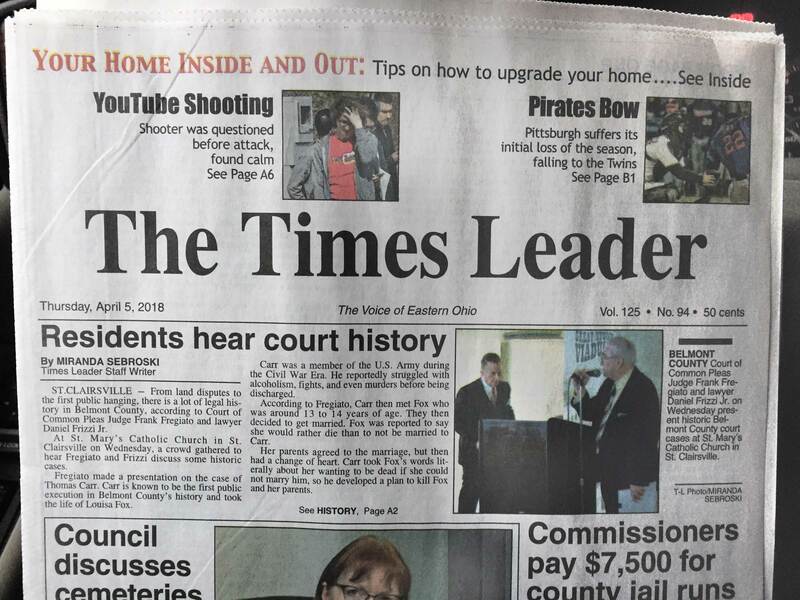 The publication was featured as an insert in Ohio Magazine. The Viaduct is listed as bridge number "2" in the inside of the publication. 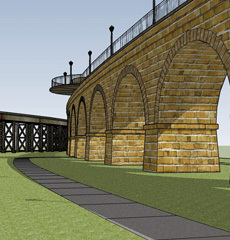 Bellaire’s Great Stone Viaduct Society has been approved for a $1.9 million Ohio Department of Transportation grant to transform the historic structure into the centerpiece of a new park, although about $350,000 in local matching funds will need to be raised. 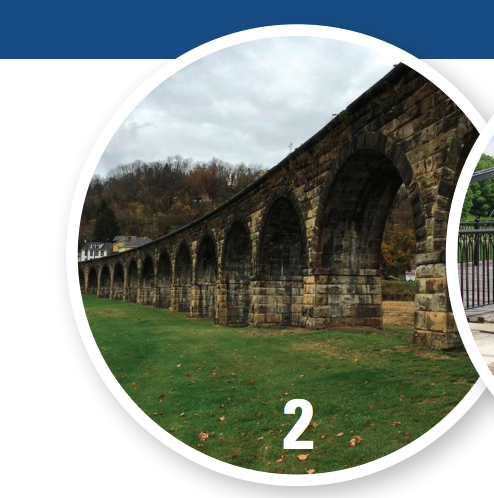 WHEELING - Bellaire’s Great Stone Viaduct Society has been approved for a $1.9 million Ohio Department of Transportation grant to transform the historic structure into the centerpiece of a new park, although about $350,000 in local matching funds will need to be raised. File Photo Bellaire’s Great Stone Viaduct Society has been approved for a $1.9 million Ohio Department of Transportation grant to transform the historic structure into the centerpiece of a new park, although about $350,000 in local matching funds will need to be raised. After years of planning, the dream to preserve Bellaire’s Great Stone Viaduct and transform the historic structure into a park may become reality, now that the project has been approved for a $1.9 million grant through the Ohio Department of Transportation. However, the use of the grant requires a 5-percent local match, or almost $100,000, and site development costs such as grading and cleaning, estimated at $250,000. This means local funds of about $350,000 must be raised before the grant can be accessed. The $1.9 million ODOT Transportation Alternatives Program Construction Grant, as well as an award of $5,000 from the Tom E. Dailey Foundation in Chicago, were announced Tuesday during the Great Stone Viaduct Historical Education Society’s third-annual All-American Banquet fundraiser. 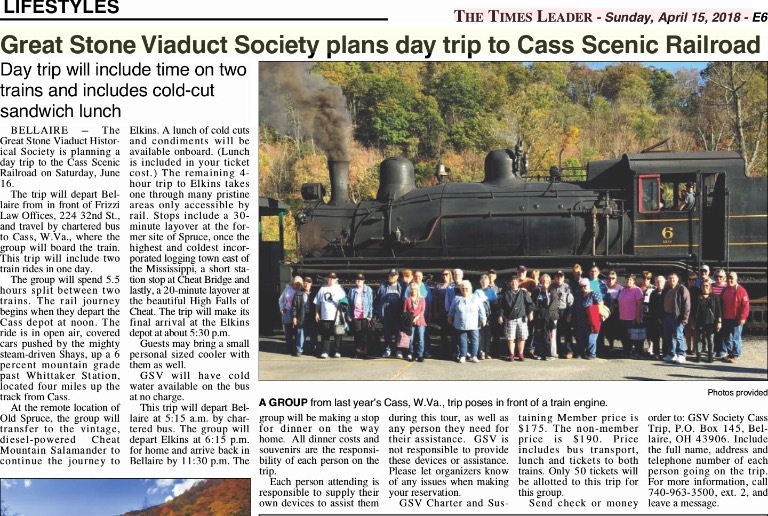 Viaduct society Chairman Paul Cramer outlined the planned project, which has been a goal since the society obtained ownership of the viaduct in 2015. Officials hope the $1.9 million grant will be enough to complete the first phase of the project. “It will include a visitor center, parking, walking and bicycling trails, an elevated walkway spanning 20 stone arches, and an observation deck at the end,” Cramer said. “Phase II of our project will need to be funded next and will continue the walking/bike trail along the railroad bed to 26th Street.” Cramer commended the society’s board of trustees for their time and effort. He also thanked the local community and businesses for their financial support and urged them to continue that support. “We need your help. 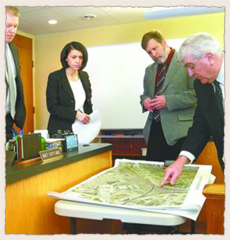 … I’m hopeful that the project can be completed in its entirety by the year 2021. 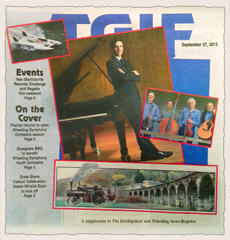 This is the year that will celebrate our 150th anniversary from the construction of the Great Stone Viaduct … ,” he said. “I’m hoping you can locate some funds to try and get this project going. I don’t want to leave the $1.9 million on the table.” In addition, Cramer announced the viaduct will be featured in the 2017 “Visit Ohio’s Historic Bridges” brochure published by the Ohio Bridge Association and ODOT. “The Great Stone Viaduct is one of only six historic bridges featured in the interior of the brochure, which is pretty amazing,” Cramer said. 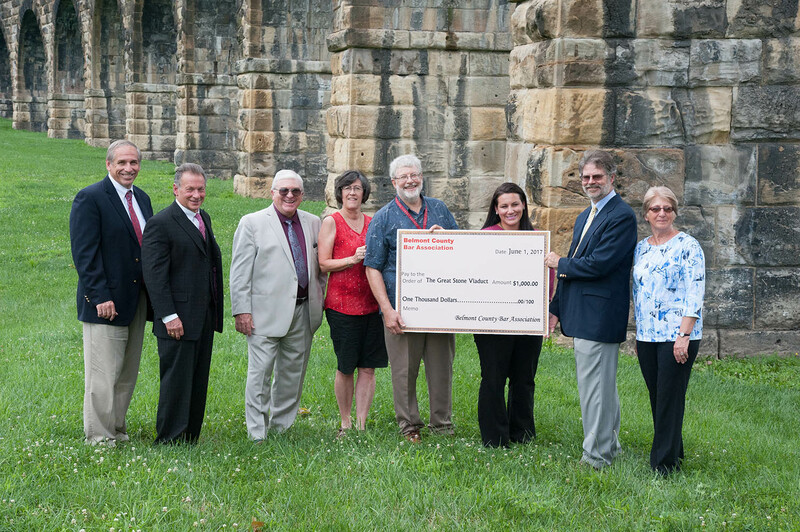 BELLAIRE - The Belmont County Bar Association, and member lawyers from both Ohio and West Virginia, have given their financial support to the efforts of the Great Stone Viaduct Historical Education Society project in Bellaire, Ohio, for preservation and development of the Great Stone Viaduct. Jeff McCamic, President of the Belmont County Bar Association announced that the Great Stone Viaduct Society has been chosen for the 2017 Annual Award of $1,000.00 to worthy causes which are supported by the Bar Association’s program of charitable giving. President McCamic, and member attorneys, presented to the GSV Society Officers a check for $1000.00, and bar members raised in addition thereto from individual contributions, an additional $750.00 for participation as a Keystone Member of the GSV Society. 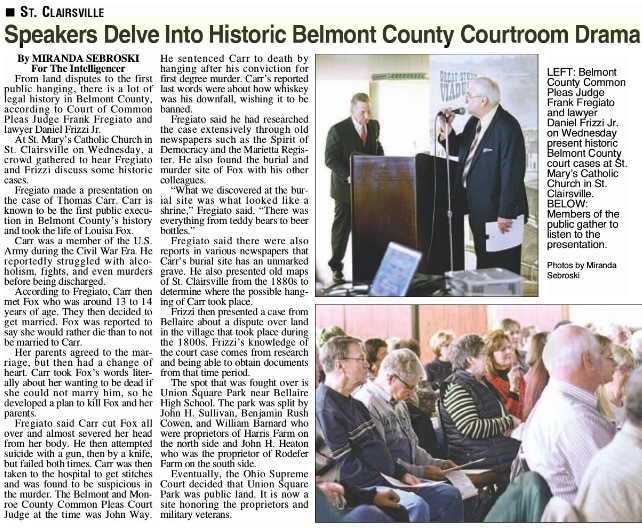 The Keystone Membership will create an arch to be known as the “Belmont County Bar Association Arch” with the remaining ring stones of that Arch reserved as Memorials for individual members of the Bar Association. President McCamic stated that the efforts of the GSV Society to preserve this historic landmark, and develop the site for a trail-head for walkers and bicyclists, is a project which caught the attention of local bar members. “This project is worthy of the Bar Association’s financial support”, he said, “and our members voted unanimously to support it”. 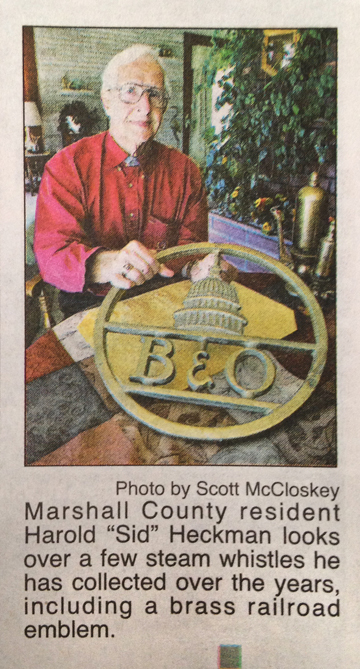 The Belmont County Bar Association Arch will join other theme arches already established for “Businesses”, “BHS Alumni Classes”, “Veterans”, “Coal Mining”, “Italian-Americans”, “Memorials”, “Railroad Workers” and “Friends of the Viaduct”. President of the GSV Society, Paul Cramer, thanked the Bar Association Members present for their generous contributions and support for this project, and stated that “this kind of local support moves the project closer to the Society’s goal of preservation and development of this historic bridge site”. The Great Stone Viaduct was constructed between 1870 and 1871 by the Baltimore & Ohio Railroad as an Ohio approach to the bridge spanning the Ohio River. The viaduct was placed upon the National Register of historic structures in 1976, and was memorialized in a Historic Marker of the Ohio Historical Society in 2006. 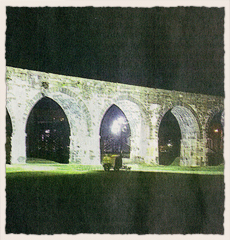 The GSV Society acquired from CSX Transportation 20 abandoned arches in 2015, together with 5 acres of land on which these arches stand. 2/1/2017 9:00 AMGSV Crocks Make Great Gifts! 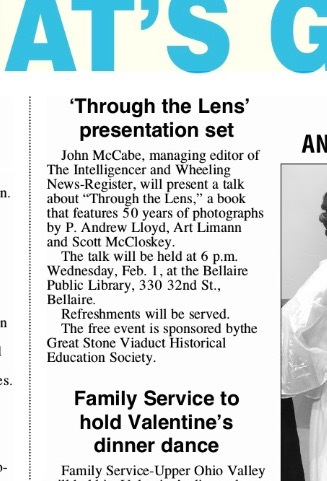 BELLAIRE - The Great Stone Viaduct Historical Education Society and the Bellaire Public Library is sponsoring a lecture on February 1, 2017 presented byJohn McCabe, editor at the Intelligencer and Wheeling News-Register as posted in today's TGIF section of the morning paper. 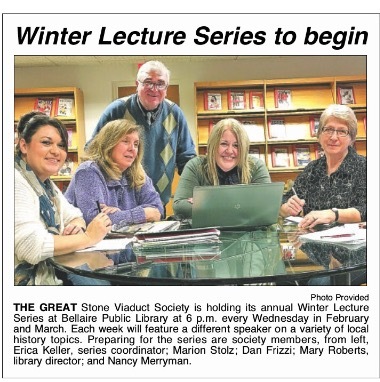 BELLAIRE - The Great Stone Viaduct Historical Education Society and the Bellaire Public Library is sponsorina lecture series beginning on February 1, 2017. BELLAIRE - The Great Stone Viaduct Historical Education Society has inked an agreement with CSX TRANSPORTATION, INC. for the purchase of abandoned railroad property in Bellaire, Ohio where twenty (20) arches of the Stone Viaduct stand. 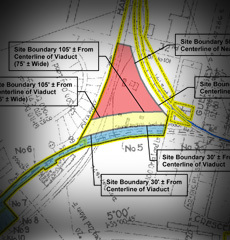 The contract, which has been in the process of negotiation with CSX officials over the past 18 months, includes 5 1/2 acres of real estate, including an approximately 1/4 mile approach to the 20 arches of the abandoned portion of the bridge which was idled in 1996 when coal shipments from the Lamira coal preparation plant ended. The arches intended to be acquired will stretch from the West side of Guernsey Street to the bridge abutment at Rose Hill. 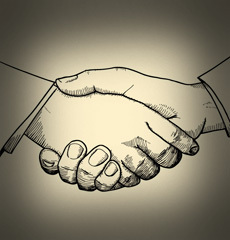 The price agreed upon between the parties is $83,000.00. The Great Stone Viaduct, for which the Society has taken its name, was placed upon the National Register of Historic Structures in June 1976, and was recognized by the Ohio Historical Society in 2008 with a Historical Marker. The viaduct is a sandstone structure consisting of 43 separate arches which traverse the downtown business district of Bellaire along 31st Street. It serves as the Ohio land approach to the railroad bridge constructed in 1868-1871 to cross the Ohio River, and its appearance is reminiscent of a Roman Aqueduct. The most beautiful portion of this viaduct, still appearing in the original sandstone construction without refacing, is the portion that the GSV Society has contracted to purchase. The remaining 23 arches of the viaduct continue in active railroad operation under control of the Wheeling & Lake Erie Railroad. 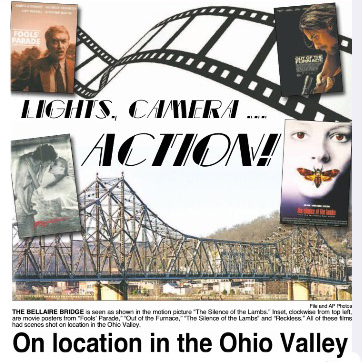 Support from the community of donors to this project, including the Belmont County Tourism Council, has assisted the Society to move this project forward since discussions about preserving this portion of the bridge began nearly 2 years ago. Local, county, and state officials have offered their support to this project, and have assisted the GSV Board in its efforts. 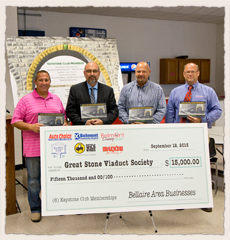 Symbolic sales of Keystones and Ringstones to the public has netted over $53,000.00 in categories designated for each of the arches to be acquired, including a "Business Arch", a "Memorial Arch", a "Coal Mining Arch", an "Alumni Arch", a "Veterans Arch", a "Friends of the Viaduct Arch", and an "Italian American Arch". Through the efforts of the GSV Board and these donors, plans for development of the site, once acquired by GSV, will help to highlight the historical significance of this bridge, and make it a historic site for visitors to Belmont County. The website maintained by the Society provides much information about the project for preservation as well as a list of those individuals and businesses who have donated to this cause of preservation. The GSV Society is in the process of completing its due diligence regarding the site and the title to be conveyed under the contract with CSX. The Society Board of Trustees hope to have this completed within the next 4 months with a closing on the contract before the end of the year. BELLAIRE - The Great Stone Viaduct is a historical landmark, and one local society is striving to make sure it is preserved for years to come. THE VILLAGE of Bellaire will come alive in less than two weeks, and it has nothing to do with high school football. 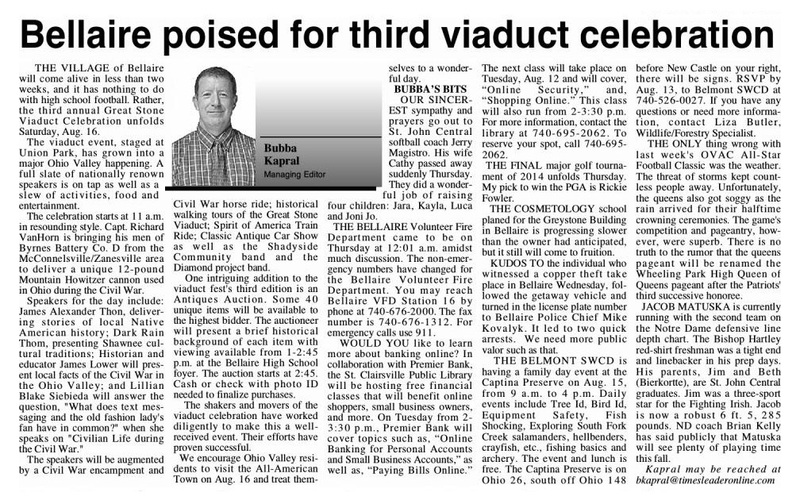 Rather, the third annual Great Stone Viaduct Celebration unfolds Saturday, Aug. 16. 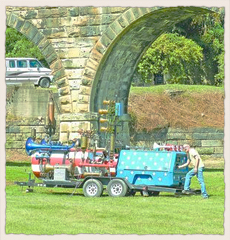 The viaduct event staged at Union Park, has grown into a major Ohio Valley happening. A full slate of nationally renown speakersis on tap as well as a slew of activities, food and entertainment. February 26, 2014 - “The Methodist Episcopal Church in Bellaire, Ohio - Bellaire's First Church” - Daniel Frizzi, Jr.
March 26, 2014 - “Belmont County Common Pleas Court Judges: Decisions that Shaped History” - Daniel Frizzi, Jr.
A cooperative agreement between the Great Stone Viaduct Historical Education Society and the Bellaire High School Alumni Association was recently approved by both organizations for the purchase of “Class Ringstones” for the planned “Alumni Arch” at the Great Stone Viaduct. The GSVSociety is promoting this as a part of the fundraising campaign to acquire, protect and preserve the abandoned portion of this historic structure. The BHS Alumni Association will be the “Keystone Member” for this arch under the banner “The Faithful and True Hearted”. Classes of 1946, 1968, 1970 and 1971 have already reserved their spot on this Arch through class purchases of a “Class Ringstone”. Under the cooperative agreement, The GSV Society will purchase for each participating class a “Memorial Brick” engraved for each class to be placed in the “Alumni Walkway” on 35th Street at the High School, in addition to being included on a GSV Society Bronze Plaque displaying all contributing classes upon acquisition of the Viaduct property. Both organizations encourage other BHS classes to participate by contacting Joanne Cochran Sullivan or Nancy Merryman of the GSV Society for more information. 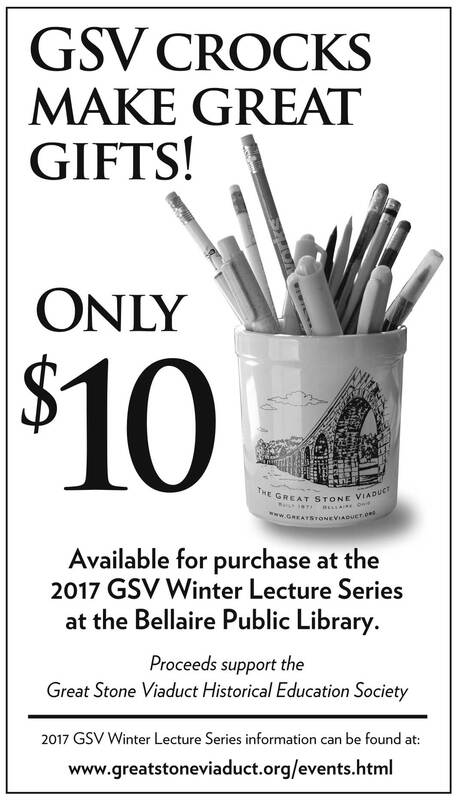 You can view the Alumni Arch, and all fundraising information, by viewing of the GSV website fund raising page at greatstoneviaduct.org where the current participating classes are acknowledged. Ask other BHS classes to “Get on Board the Big Red Express” by participating in this cooperative effort to protect and preserve the GSV and support your Alumni Association. BELLAIRE - Bellaire Village Council recently passed an ordinance establishing a historic landmarks commission for the village. 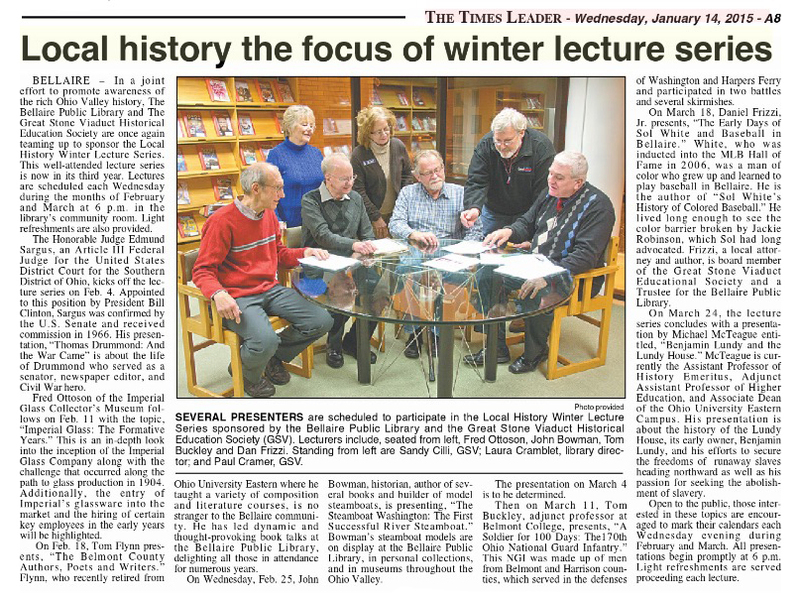 In part, this was brought about by the Great Stone Viaduct Historical Education Society. 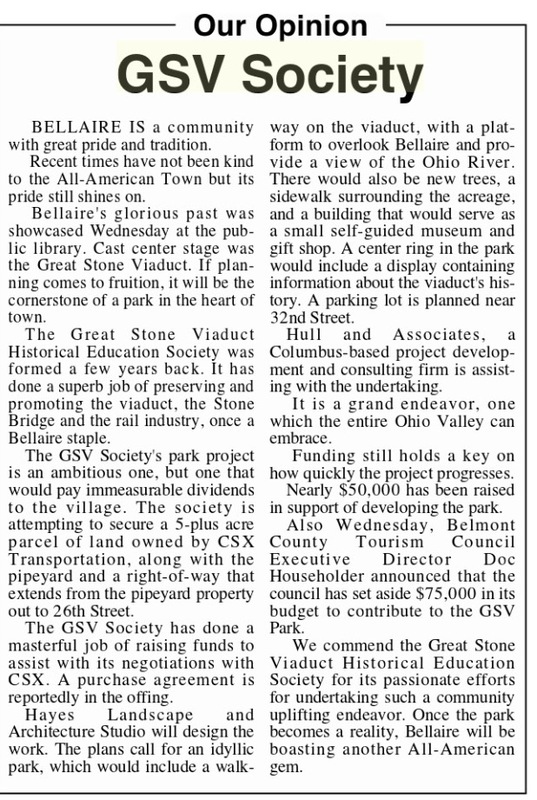 THE GREAT Stone Viaduct Historical Education Society (GSV Society) formed just 18 months ago to become a non-profit 501 (c) 3 corporation. The stated purpose was to educate and promote public awareness of our rich heritage, and to protect and preserve important parts of our built environment that exemplifies that heritage. With the conclusion of the second Stone Viaduct Celebration, which included a steam whistle expo, hopefully all are aware of the mission and purpose of this organization. 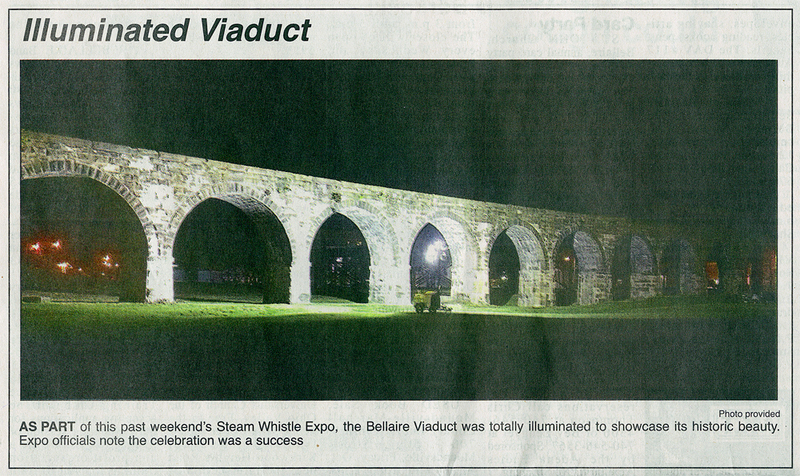 AS PART of this past weekend's Steam Whistle Expo, the Bellaire Viaduct was totally illuminated to showcase its historic beauty. Expo officials note the celebration was a success. 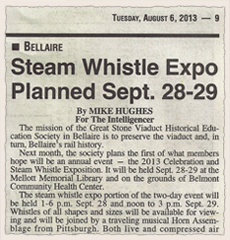 BELLAIRE - The Great Stone Viaduct Historical Education Society hosted the Steam Whistle Expo this weekend. A MAJOR celebration is coming down the tracks in the All-American Town this weekend. 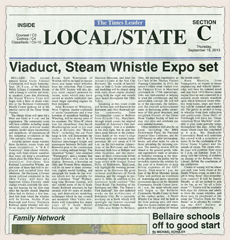 The 2013 Celebration & Steam Whistle Exposition unfolds in Bellaire Saturday. It is shaping up as a magnificent celebration, one that promises to bring in a large outpouring of visitors to town. 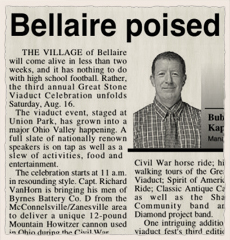 The second annual Great Stone Viaduct Celebration will begin at 9 a.m. Saturday at the Bellaire Public Library Community Room with a linup of exhibits and history speakers. 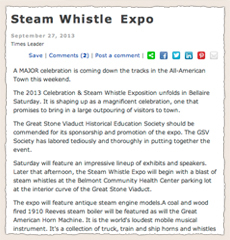 Later that afternoon, the Steam Whistle Expo will begin with a blast of steam whistles at the Belmont Community Health Center parking lot at the interior curve of the Great Stone Viaduct. 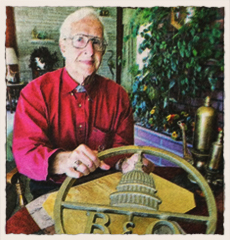 For more than four decades, 87-year-old Marshall County resident Harold “Sid” Heckman worked as a railroad conductor with the B&O Railway, the first 12 of those years spent aboard steam engine trains that traveled throughout the Ohio Valley and deep into the coal fields of West Virginia. ALL THAT remains is two days of good weather. The Great Stone Viaduct Historical Education Society has done everything possible to promote the 2013 Celebration & Steam Whistle Exposition. The two-day extravaganza unfolds this Saturday. 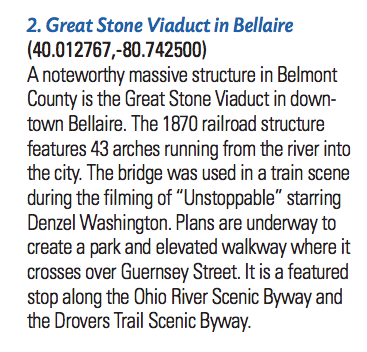 The second annual Great Stone Viaduct Celebration will begin Saturday, Sept. 28, 9 a.m., at the Bellaire Public Library Community Room with a lineup of exhibits and history speakers. Later that afternoon, the Steam Whistle Expo will begin with a blast of steam whistles at the Belmont Community Health Center parking lot at the interior curve of the Great Stone Viaduct. I SAW signs of progress in Bellaire Thursday. It was delivered at the Business After Hours program at the Bellaire High School cafeteria. 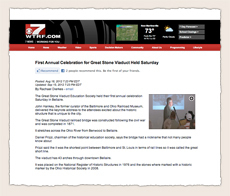 The well-attended event was sponsored by the Great Stone Viaduct Historical Education Society. Inclement weather forced the program indoors. It was originally scheduled to be staged near the viaduct. 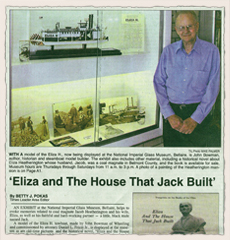 An exhibit at the National Imperial Glass Museum, Bellaire, helps to evoke memories related to coal magnate Jacob Heatherington and his wife, Eliza as well as his faithful and hard-working partner – a little, black mule named Jack. 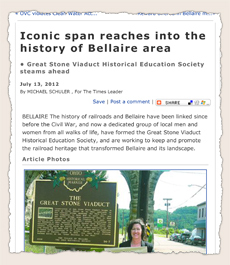 BELLAIRE — The Great Stone Viaduct Historical Education Society in Bellaire is constantly striving to preserve the viaduct, and in turn, the village of Bellaire's rich history in rail. Next month, the society plans the first of what figures to be an annual event, the 2013 Celebration and Steam Whistle Exposition. 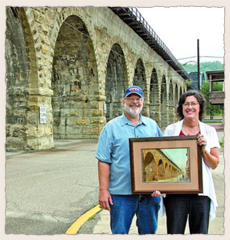 BELLAIRE — “Under the Arches” of the Great Stone Viaduct is the name given to the second in the series of watercolor prints of scenes of this historic structure commissioned by the Great Stone Viaduct Historical Education Society. 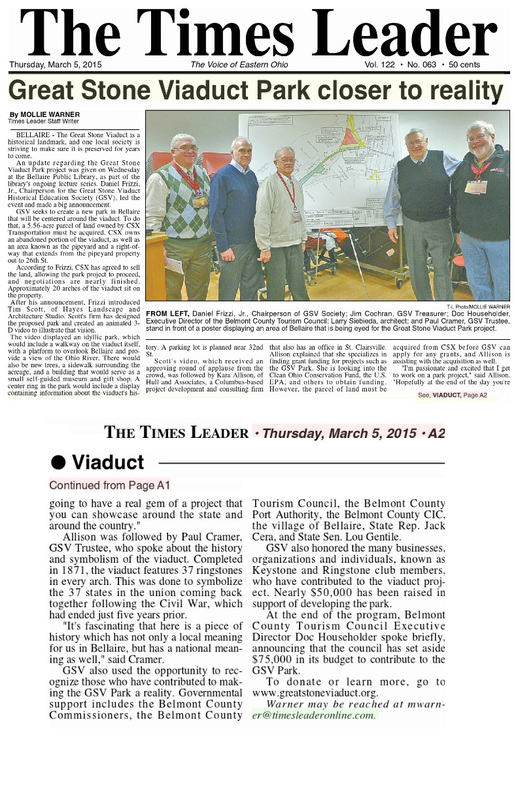 BELLAIRE — Dan Frizzi from the Great Stone Viaduct Historical Education Society and his board members are doing their best to get their plans involving the preservation of and education about the iconic structure off the ground. The GSVSociety announces that two well known speakers to Baltimore and Ohio Railroad enthusiasts have agreed to participate and present lectures at the Great Stone Viaduct Celebration scheduled for Saturday, September 28, 2013. Both will continue in the tradition begun last year of providing scholarly material relating to the railroad history of the upper Ohio Valley. 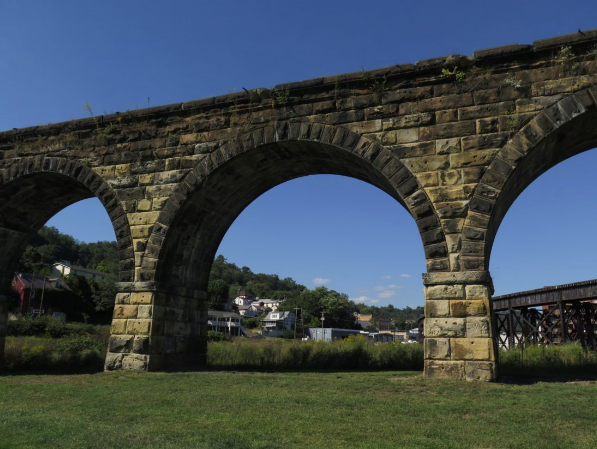 ST. CLAIRSVILLE - Belmont County Commissioners passed a resolution Wednesday endorsing the efforts and goals of the Great Stone Viaduct Historical Education Society, Inc. 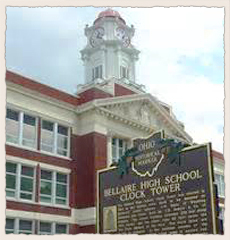 The non-profit organization is dedicated to preserving and promoting the structure in Bellaire. A TOUR involving such railroad sites as The Great Stone Viaduct in Bellaire and Roseby's Rock in West Virginia is scheduled Sunday, Dec. 16, between 1 and 6 p.m.
John Hankey, the former curator of the Baltimore and Ohio Railroad Museum, delivered the keynote address to the attendees excited about the historic structure that is unique to the city. 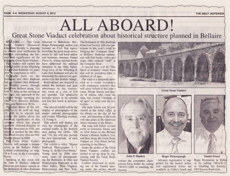 BELLAIRE — The Great Stone Viaduct Historical Education Society is planning its charter year celebration in Bellaire surrounding the history and significance of the imposing Great Stone Viaduct. BELLAIRE — The history of railroads and Bellaire have been linked since before the Civil War, and now a dedicated group of local men and women from all walks of life, have formed the Great Stone Viaduct Historical Education Society, and are working to keep and promote the railroad heritage that transformed Bellaire and its landscape.